Working with Crabapples for jelly! - Canning Homemade! Home » crabapples » Working with Crabapples for jelly! Working with Crabapples for jelly! One of the basics of canning during the season is making a jelly. For many its the most difficult to get to the proper consistency. I'm here to say that even after a few years I still have a miss now and then. In the Ball's Complete Book of Home Preserving there is a section on "Old Fashioned Jellies" which has three recipes of our youth, Crabapple, apple, and grape. These basics use sugar as the way that the jelly gels by heating the sugar to a soft ball which is what happens when you heat sugar to 220 degrees. This isn't quite like making candy, a thermometer is nice to have, but there are some tricks to making sure that you get the perfect gel. 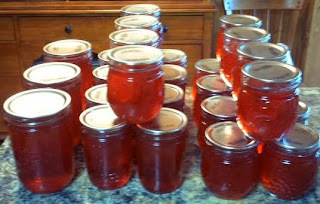 Terri took the plunge and made the Crabapple Jelly that turned out amazing! Thank you Terri for sharing your work! The gel methods are a good skill to learn as many recipes can be used with these tests of the consistency of the gel. soft spread. Lift the spoon and hold it horizontally with edge down so that the syrup runs off the edge. As the mixture cooks, the drops will become heavier and will drop off the spoon separately but two at a time. When the two drops join together and “sheet” off the spoon, the gel stage has been reached. From Terri: Hint: to get juice I just covered crabapples with water and boiled till soft, then let drip through jelly bag (takes a while) but sure does turn out clear! Preparation : Prepare 6 half pint jars and a quarter pint jar, lids, and rings. Sterilize the jars and keep them in the hot water till its time for processing. Make sure to fill your water bath canner and get the water to a simmer. Cooking: In a stainless steel or enameled dutch oven combine crabapple juice, lemon juice, and sugar. Bring to a boil over medium-high heat, stirring to dissolve sugar. Boil hard, stirring to dissolve sugar. Boil hard, stirring frequently, until mixture begins to sheet from a metal spoon or use the test gel. (See above) This will take about 25 minutes. Remove from heat and skim off foam if needed. Filling the jars: Using your funnel in each jar ladle the mixture into the jars leaving 1/4" headspace. Taking a clean papertowel wet it with warm water and wipe the rims of the jars removing any food particles that would interfere with a good seal. Using your magic wand extract the lids from the hot water and place them on the now cleaned rims. Add your rings to the tops of each of the jars and turn to seal just "finger tight". Processing: Place the jars in the water bath making sure that the water covers each of the jars by 1 to 2 inches. Add hot water to the canner if it doesn't measure up. Cover the pot and turn up the heat under the canner and wait for the water to start boiling. Once the water has come to a boil start your timer for 10 minutes. When complete turn off the heat and remove the cover and let the jars sit for another few minutes. Remove the jars and place them back on the dishtowel in a place that they will sit overnight to cool. Do not touch or move them till the next morning. Sealing: Some time in the next hour your jars will be making a "pinging" or "popping" noise. That is the glass cooling and the reaction of the lids being sucked into the jar for proper sealing. Some recipes may take overnight to seal. Check your lids and reprocess any jars that did not seal. Labeling: Make sure to label your jars after they have cooled with the name of the recipe and the date canned. If you want to use the shrink labels in the picture you can order them Here!